We’d love your help. Let us know what’s wrong with this preview of The Ultimate Morpheus Collection, Volume 11 by Pennie Mae Cartawick. To ask other readers questions about The Ultimate Morpheus Collection, Volume 11, please sign up. Now I just want to state up front that I'm not a huge fan of Sherlock Holmes. I can't even bother to watch Elementary or BBC's Sherlock regardless of how much I adore Benedict Cumberbatch and Lucy Liu, so when I started reading Ms.Cartawick's book, I didn't expect anything. Instead I found myself pleasantly surprised. I enjoyed snarky Sherlock and ever devoted Watson. I let the author's writing carry me away into each perfectly described scene. She captured the voice of Sherlock for me along with Now I just want to state up front that I'm not a huge fan of Sherlock Holmes. I can't even bother to watch Elementary or BBC's Sherlock regardless of how much I adore Benedict Cumberbatch and Lucy Liu, so when I started reading Ms.Cartawick's book, I didn't expect anything. Cartawick writes of the adventures of Holmes, recording cases not otherwise known. The tales are free of crude and distasteful elements found in modern books of like nature. The Holmes stories have elements of a novel. The caracters and setting is the same. Thus, they resemble episodes of a TV series. However, less time is spent than with a true novel. Good work. Good read! You'll enjoy this one if you think of it as a fantasy based on Sherlock Holmes instead of comparing it with the original. The author's writing was flowing and compelling and the stories were certainly entertaining. 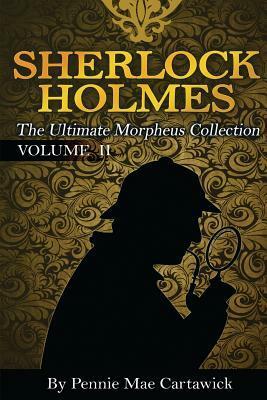 Fun, witty, mysterious collection of stories that pay homage to the writings of Arthur Conan Doyle. I loved the color illustrations, photos, and artwork accompanying the text. It’s a minor point, perhaps, but it made me wonder why all books don’t come this way, because it really classes things up. It seems to particularly suit a vintage character like Sherlock Holmes and a collection of his tales. Okay, onward to what matters most, a critique of the stories themselves. The most striking feature right off the bat is how well the author captured the original voices of Holmes and Watson, the feeli I loved the color illustrations, photos, and artwork accompanying the text. It’s a minor point, perhaps, but it made me wonder why all books don’t come this way, because it really classes things up. It seems to particularly suit a vintage character like Sherlock Holmes and a collection of his tales. Okay, onward to what matters most, a critique of the stories themselves. The most striking feature right off the bat is how well the author captured the original voices of Holmes and Watson, the feeling of what it’s like to be inside their heads, that I got from reading Arthur Conan Doyle. So fans who wish he was still alive and writing will well enjoy the Lazarus, back-from-the grave effect they will get from reading these short stories. It was enjoyable to see Holmes’ lasting effect on Watson as Watson’s own powers of observation and detection begin to increase for having lived with and worked alongside his partner for so long. I think that’s one advantage some readers may have over me who are not jumping into this series late as I am, but caught volume one of the tales, the chance to see Watson at the beginning of his character arc. Seeing Holmes ply his trade is fun as always, but just as enjoyable as his investigative acumen are his wildly imaginative plots to foil the bad guys. And I do mean imaginative; the schemes he came up with left me hang-jawed, while seeming like just the thing a devious, brilliant mind would concoct. The author did her homework, and the historically correct period references and details add nice highlights and flourishes, such as the doorman showing up to brush Watson’s suit for the morning, or his enjoying the cutting-edge technology of the first of the hotels in his area to get an elevator. The stories flow very well due in no small part to the author’s engaging writing style. There wasn’t much to mar the reading experience. I did note a fair amount of typos in the first short story, but they were within the professional range, and later short stories were cleaner. At times I thought of the Perry Mason franchise that was so popular on TV for so many years in that those writers often omitted information that kept you from possibly knowing what Mason was up to. Here too that device was employed. I think it would have been more effective to leave some clues that only in retrospect, after Holmes explained what was going on, the reader could reflect on the early clues and think, “Ah ha! I should have seen that.” There were other times when Holmes’ method of solving the case didn’t seem as uniquely brilliant as all that as befitting the Holmes character. But there’s no denying how much fun these stories are as a whole. As part of a generation who grew up before the internet and gadget era, I was on who would make regular visits to the local library, my number one read? Sherlock Holmes of course! That’s why I pounced at the chance to read this book like a cat on a fresh piece of tuna. This book is a compilation of 10 short stories on our timeless, iconic and beloved mystery solving duo; Sherlock Holmes and Dr. Watson. This is a must read for any avid Holmes fans. Brilliantly told and engaging, the author Pennie M As part of a generation who grew up before the internet and gadget era, I was on who would make regular visits to the local library, my number one read? Sherlock Holmes of course! That’s why I pounced at the chance to read this book like a cat on a fresh piece of tuna. This was a great set of tales from the famous detective, Sherlock Holmes, and his sidekick, Watson. From the tale of Watson's "twin" to the disease curse put on Holmes, the stories went right along with the strange and interesting mysteries that these two are always trying to solve. The few grammar problems in this book is what kept me from giving it five stars, but the personalities of the characters were spot on. It was an exciting read. I really enjoyed this book. The detective style dialogue and plot was really fun to read. Particularly, the voice of the narrator which was true to the genre, from start to end with deductive questioning and tongue-in-cheek references. Holmes & Watson's mysteries took us all over world: the back streets of London, the French Alps, across countries in trains and more! Each of the stories introduced a new case. It was a fun and engaging read! I really loved this book! I'd never read any Sherlock Holmes stories, I've seen films and TV shows but never read anything, I'm so glad I've read this book! For a world and characters that have re-created so many times in the past I thought this author did an amazing job of bringing it back and putting her own stamp on things. I was gripped all the way through even though I don't normally read this genre. All in all I loved it! Sherlock Holmes the Ultimate Morpheus Collection follows the adventure of Holmes and Watson as they investigate everything from jewel thieves to assassins. I found these stories intriguing and compelling. I very much enjoyed the perspective in which the stories are told.The stories keep you guessing until the very end. The stories are well-thought out and action packed. I enjoyed this book and would recommend it to those who like to read mystery, action, and suspense. Beautifully well crafted set of Sherlock Holmes short stories. Having never read a book about Sherlock Holmes I bought this on a whim, a whim that didn't disappoint. The proper use of English in the interaction between Holmes and Watson was endearing and the adventures mysterious, overall being a great introduction to the genre that I'll be visiting again soon! I love a little bit of mystery, and this volume definitely has it. Sherlock Holmes and and Doctor Watson are a great team as they do what they do best, work together. The author does an excellent job of drawing the reader in, and keeping the reading wondering whats going to happen next. I must say I was impressed with the story line of the book. I love the set up, great read! Gave up. Total crap. I noticed that the five star reviews were by people who said they never liked the Sherlock Holmes stories. That makes sense now. I'm sure Mrs. Hudson would be very surprised to know that Holmes had hired a "serving woman, Mrs. Quigley" to answer her door. Pennie Mae Cartawick is a best selling author of both fiction and nonfiction books. Her work is based on a variety of subjects including weight management and nutrition, recipe books, horror novelettes, and short Sherlock Holmes mysteries. She was born in the city of Sheffield in South Yorkshire, England and emigrated to Florida in 1993.